Summer fashion can always be fun, playful, bright and colourful but for a more glamorous, fresh look that shows off your tan I love wearing white. White is always clean and light, you cannot go wrong. If you enjoy my wish lists then you can find more of my previous wish list posts here. White is light, bright, and absolutely fantastic against sun-kissed skin. I love the Selfridges DM LONDON Round plastic watch, even more so now that it is half price. The Selfridges white watch is simple, modern and will go with any outfit. Over summer it will look great contrasting against a tan. This weeks white wish list features affordable items starting from only £7. At that sort of price it really makes it hard to keep my card unused this summer. 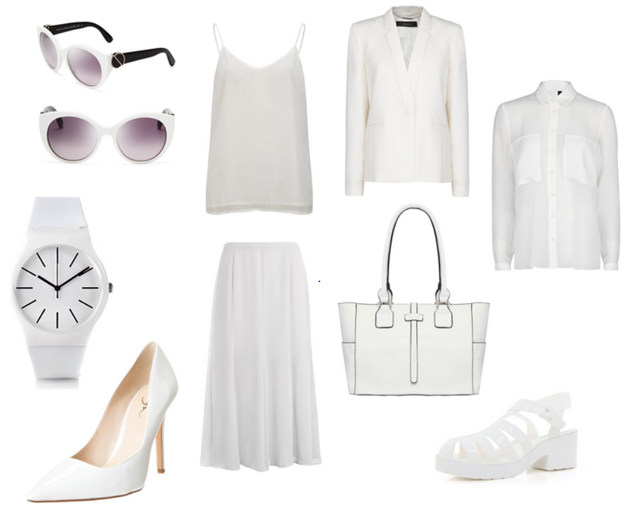 My white wish list items are so simple to coordinate and are key essentials to your summer style wardrobe. I would team my white wish list with metallic accessories to add a bit of glam and a neon statement piece to stay on trend this summer. I look forward to reading your comments on this wish list, let me know what items you love the most and let me know if you think I missed any must have items from this list! Do not forget to share and tweet about this list. If you find anything that must be added let me know in the comments below. What is your favourite item in my White wish list?